One of the nicest things about the TUT Ravelry group is when regular members who have been so supportive of my yarns publish a pattern. It’s so nice to see my yarns helping to create inspiration in designers and being able to share their talents here on the blog. Maanel has been a regular in the group, sharing her many wonderful projects and so when she published this design, I asked instantly if we could share it as it’s truly beautiful. 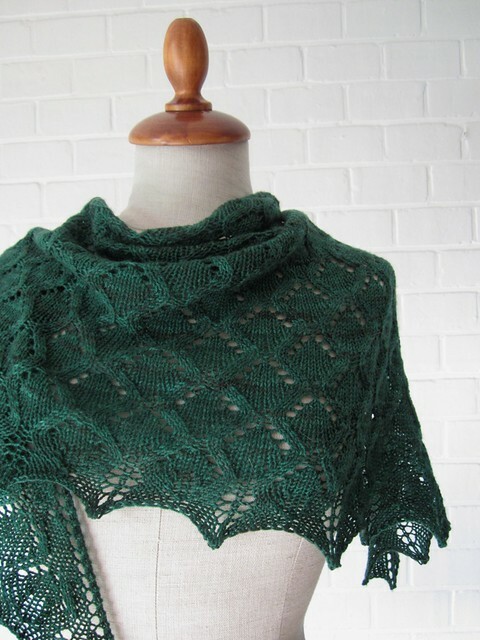 The Green River Shawl is a top-down triangle shawl with two edge stitches and a 1 stitch center spine. The increases are worked four at a time on every RS row so this is a quick and easy to memorize knit. The construction makes the lace easy to read and the motif is simple enough that I’d say this would be good for adventurous beginner’s to dive into the world of lace. I think the lace detail is charming. The shawl is worked in Super Sock, a super soft 2ply yarn that can be worn right next to the skin. It has a high twist and lovely texture. Although I recommend hand-washing to prolong the life of your knits, this yarn may be machine washed on a gentle wool cycle, then laid flat to dry so it would be a hardy accessory that could be worn time and time again easily. The colour of the sample is called ‘Dartmoor’ a deep and luscious green but I can imagine this in lots of different colours due to its’ striking motif. 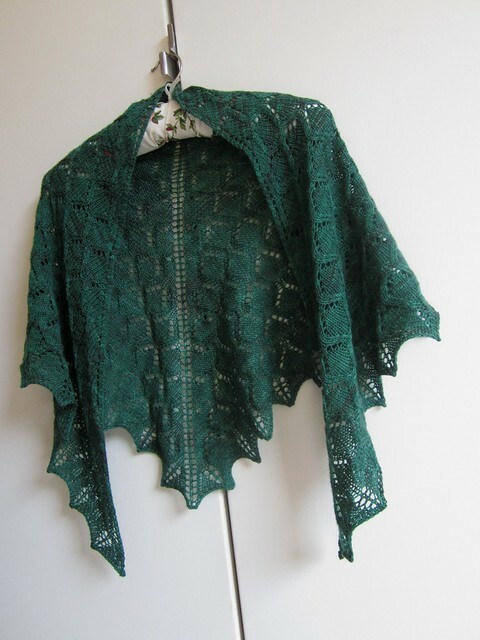 A fabulous shawl pattern Maanel, well done! oh ! thank you Ce ! I’m very flattered by all these kind words !